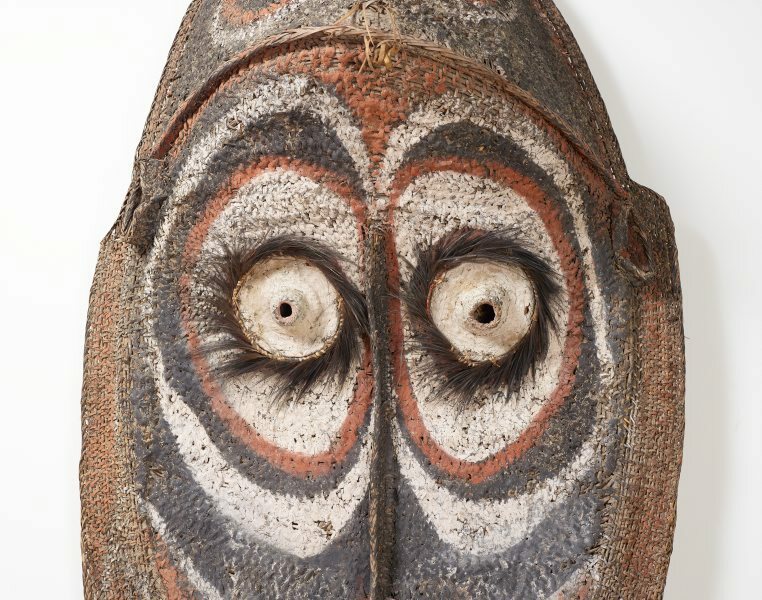 Across the Sepik, spectacular ceremonial houses are found in every village. They are known as 'geko', 'ŋgaigo' or 'ngeko' in Iatmul, and 'haus tambaran' in Pidgin. 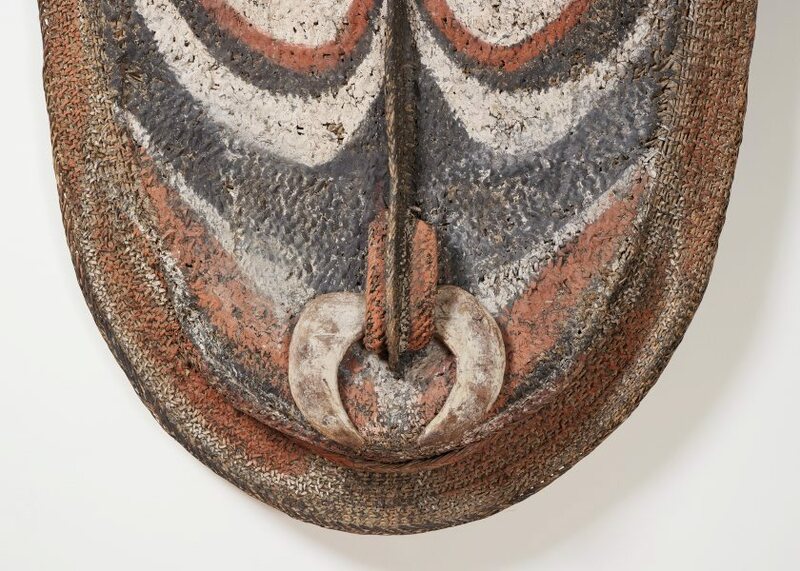 In the Middle Sepik, the 'geko' embodies the paramount female ancestor whose enormous face appears on the gable and whose name is given to the house. Clans descending from a common ancestor build the 'geko', where cult objects are stored. Only men who are initiated are permitted inside the 'geko' and, during ritual ceremonies, the house becomes 'hot', indicating the presence of spirits. 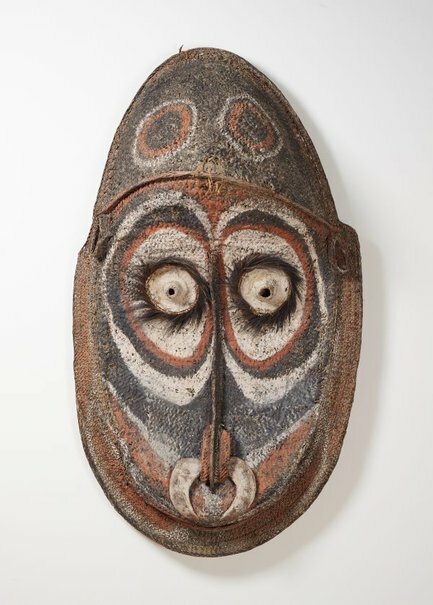 Gable masks are either carved from wood or woven using split rattan cane and are hung high above the entrance of the 'geko'. Woven examples such as this feature prominent foreheads, separately attached ears and broad, open mouths filled with fine teeth. 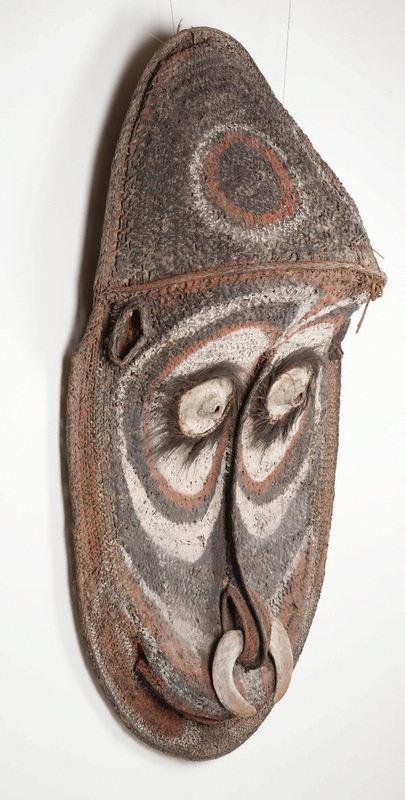 Tony Tuckson, Art and Australia , 'Primitive art collection', pg. 76-79, Sydney, Jul 1972, 79 (illus.). Image of work in the 'Primitive Gallery' at the AGNSW in 1972, with other works from the collection. Art Gallery of New South Wales Quarterly , Sydney, Apr 1965, 232 (illus.). Art Gallery of New South Wales Quarterly (vol. 13, no. 4) , Sydney, Jul 1972, 697 (illus.). "The primitive art area is temporarily situated on the first floor. Exhibits are from the Sepik River, New Guinea, along with a grave-symbol figure from New Hebrides, in the left foreground". The 'Gable mask' is seen on the wall, together with other works collected by Tuckson in the 1960s and early 1970s.